I had an accident that caused a blow to my skull so great I started to exit from my body. I traveled down a tunnel of light and was greeted by friends and relatives who had passed away years before. I came into the presence of a “Being of Light” who enveloped me in pure unconditional love. Thoughts of unworthiness and shame for things I had done in the past made a brief, futile effort to invade this aura of love. Faster than the thoughts could arise, they evaporated. It was more than being forgiven. The “Being of Light” communicated to me that I, too, am made of light, and in that light there is nothing to forgive. This was 1976. No one then was talking about “Near Death Experiences,” so it wasn’t until years later that I had an explanation for what had happened to me. All I knew at the time was that my life had been changed forever. I had already been studying Hatha Yoga for about six months. From then on, I made it the center of my life. Two years later, I met Swamiji, and soon after had a private interview with him. At the end of the interview, I asked if I could touch his feet. This was no small thing for me. My father had died ten years earlier, when I was fourteen. (He was one of those who greeted me in the tunnel of light.) 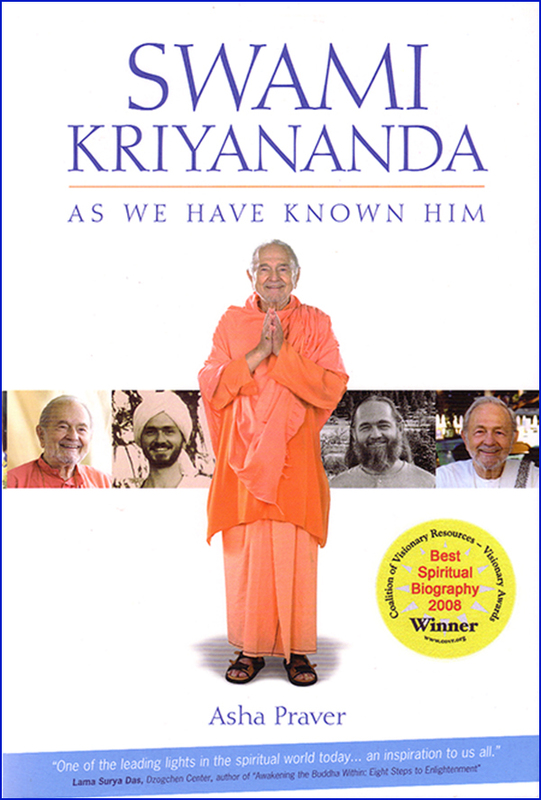 Since then, I had been very headstrong and refused to take advice from anyone – until I met Swamiji. Now I wanted to bow down in front of him and put my life in his hands. In India, touching the feet of a spiritual teacher is a common gesture of respect. Swamiji, however, has never encouraged that kind of outward show, but he must have sensed how much this meant to me, so he gave his permission. He was sitting in a chair and invited me to kneel in front of him. Reverently I placed my hands on his feet and bent over until my forehead was almost resting on the backs of my hands. After a moment, I felt Swamiji gently lifting me by the shoulders until we were face to face. He closed his eyes and touched me at the spiritual eye. I closed my eyes to receive his blessing. A horizon line formed before my closed eyes, illuminated from below, as if the sun were about to rise. Beams of white light streamed from the hidden sun. I was bathed in luminescence. I forgot myself. I forgot that Swamiji was blessing me. All I knew was light, peace, joy, and what I can only describe now as a state of utter “desirelessness.” In that moment, every imaginable fulfillment was mine already. Then Swamiji removed his touch and the light went away. I looked into Swamiji’s eyes, which were now just inches from mine, and saw there a quality of impersonal, yet unconditional love that I had never seen in anyone else before. Only later did I link the two experiences. Twice I’d been touched by the light. The first time, I had to leave my body and go into another world to experience it. The second time, the light came to me, when I was willing to bow in humility and reverence before its pure channel: Swamiji.